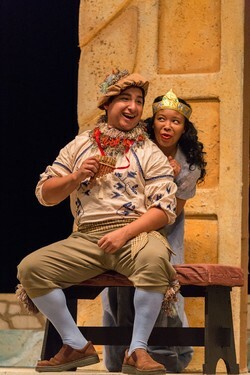 Vocal performance graduate student Amanda Sheriff of Houston performs as Pamina alongside sophomore Greg Garcia of San Antonio as Papageno in the SFA Opera Theater production of Mozart's "The Magic Flute," which opens Thursday for a three-night run in W.M. Turner Auditorium on the SFA campus. NACOGDOCHES, Texas - Veteran voices heard during recent years in SFA's Opera Theater will share the stage with some of the university's younger voice performance students when Stephen F. Austin State University presents "The Magic Flute" April 12 through 14 in W.M. Turner Auditorium. Sophomores with their first leading roles and graduate students completing their master's degrees will showcase the depth and versatility of talent within the SFA School of Music when the students perform in W.A. Mozart's fairy tale for all ages. SFA Opera Theater favorites Kelsey Quinn of San Antonio and Amanda Sheriff of Houston first appeared as freshmen in operas performed on Turner stage, and both are now completing their Master's of Music degrees in vocal performance. They share alternating roles as Pamina in "The Magic Flute." Evelyn Shaffer of Mont Belvieu and Emily Bulling of Katy came to SFA as freshmen music education majors and are now completing their master's degrees in choral conducting. Shaffer has a leading role of Third Lady, while Bulling portrays the Queen of the Night in "The Magic Flute." Performing alongside these seasoned vocalists are sophomores Greg Garcia of San Antonio as Papageno, Logan Ray of Lubbock as Sarastro, and Taryn Surrat of Houston as Papagena. "SFA is quite unique in that we train all of our voice majors with the same goal - to reach their highest potential as excellent singers," said Dr. Deborah Dalton, associate professor of voice at SFA and stage director of "The Magic Flute." "Most university voice programs only feature performance majors in leading roles," she said. "At SFA, the best singer, regardless of emphasis (music education/performance), wins the role." Although Bulling is a music educator, the Queen of Night is her first vocal stage role at SFA, and it's been a unique learning experience, she said. "I have learned so much about what it takes to put on a production and the outside time commitment that a role requires; it is so much more than 'parking and barking,' as I have thought," Bulling said. "There is so much planning that goes into every rehearsal, and if you come unprepared, it shows! This is something I will take into every choral rehearsal I will have - the need to take the time to go over how you want rehearsal to go and plan every step. I am so honored to get to work with so many friends in one of my favorite operas." As a newcomer to the SFA Opera Theater stage, Ray said that one of the best lessons he is learning is "to know when to ask for help." "There are many students who are older and more experienced than me, and I have much to gain from listening to their advice and using it to better myself in my role," Ray said. "Getting to perform with the all of the older students is awesome. Not only are they amazing to watch and sing with, but knowing that I get to perform with them in their final roles gives me even more motivation to make it a great show for them." Making sure music and lines are memorized so that blocking goes smoothly is one lesson Garcia has learned in his first opera experience. "It's hard to block the scenes with music in our hands," he said. "It's truly and honor and a blessing to be working alongside such talented and amazing people. I always welcome criticism from them because I know it will make me better." Quinn said her definition of "busy" has changed over the years, especially when it comes to preparing for an opera production. "I think what I have really learned from SFA is that I can do this," she said. "It's hard work, and it's certainly a big commitment, but I've never gone into an opera feeling like I couldn't do it. After six years, I feel like if I can do this, I can do anything. I think that confidence and assuredness is what I will take with me as I go out into the real world. I have been taught well at every level, and I am prepared for whatever may come. That's a blessing that comes with a great faculty, and I have been incredibly lucky to be taught by some of the very best." Gaining confidence and being vulnerable are the two biggest lessons Sheriff has learned in her six years at SFA. Before coming to SFA, Sheriff said she had never even seen an opera, and now she is consistently cast in lead roles. "I just thought I was coming to college to learn how to sing better choral sounds and conduct," she said. "Never in my wildest dreams did I think I would pursue a masters in vocal performance and have dreams to perform opera on a professional level." Sheriff said she still struggles daily to build confidence in her performances. She says insecurity "comes with the territory." "I think that opera at SFA has taught me how to negate my self-doubt with positivity, consistency and vulnerability," she said. "To be completely vulnerable in a rehearsal or on stage takes confidence. You cannot give it your all on stage without allowing the audience to see your soul." Performing a variety of operatic roles, from reserved nun to comic relief, has challenged Shaffer to grow as a performer and individual during the past six years. "I have learned so much from my colleagues," Shaffer said. "Nothing can compare to seeing their transformations in just a semester, as I see them come alive during these performances." She said the lessons she will take from her experiences in SFA Opera Theater are innumerable. "As an educator, the most important thing that I have witnessed is a student's ability to thrive with the correct instruction and encouragement," Shaffer said. "Students can always surprise you as they grow up, and I hope to only aid them to become better than they ever expected from themselves, just as these wonderful SFA professors have done for me. I am truly grateful and cannot wait to see the finished product for this year." Tickets to "The Magic Flute" are $15 for adults, $10 for seniors and $7.50 for students and youth. For tickets or more information, visit http://www.finearts.sfasu.edu/ or call the SFA Fine Arts Box Office at (936) 468-6407. Performances are at 7:30 p.m. Thursday through Saturday.